CXP Verification IP implements digital interface for high speed image data transmission and intended mainly for Machine Vision applications. The interface is also suitable for other imaging applications and for high speed data transmission in other fields. 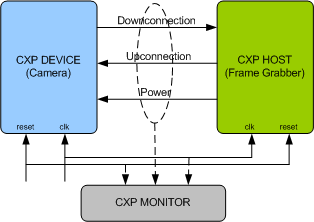 CXP Verification IP provides an smart way to verify the CXP standard video data transmission and control interfaces between Host and Device. The SmartDV's CXP Verification IP is fully compliant with CXP specification and provides the following features. Full CXP Device and Host functionality. Supports Device and Host Mode. Supports High Speed Up connection. Supports following bit rates for high speed downconnection & upconnection. Supports 20.83 Mbps for low speed up connection. Supports packing of all the video formats supported by the CXP v1.1.1 specification. Supports the following color format. Supports Bootstrap register set as per CXP v1.1.1 specification. Supports packet multiplexing from different streams. Supports connection test facilities to test the quality of the connection. CXP Verification IP comes with complete test suite to test every feature of CXP v1.1.1 specification. Functional coverage for complete CXP features. Faster testbench development and more complete verification of CXP designs. SmartDV's CXP Verification env contains following. Complete regression suite containing all the CXP testcases. Examples showing how to connect various components, and usage of Transmitter,Receiver and Monitor.